Have Ski Holidays Got Better? Night trains have always been popular with skiers. After all, who doesn’t love the idea of being whisked through the countryside while asleep, only to wake up in the Alps? So with a new Nightjet sleeper train service to the Austrian Tirol, it was time for a ski safari by train. There’s definitely something of the “magic carpet” feel to night trains to the Alps. You lie down and get taken to far-off slopes – adding an extra day’s skiing either side of your holiday. However, in recent years, this romantic – and very practical – idea has been bludgeoned by hard-nosed decisions to cull services. In 2008, the legendary Disco Train was axed by Rail Europe as a result of the economic crisis. Then, two years ago, SNCF brutally axed most of its sleeper-train network to save costs. 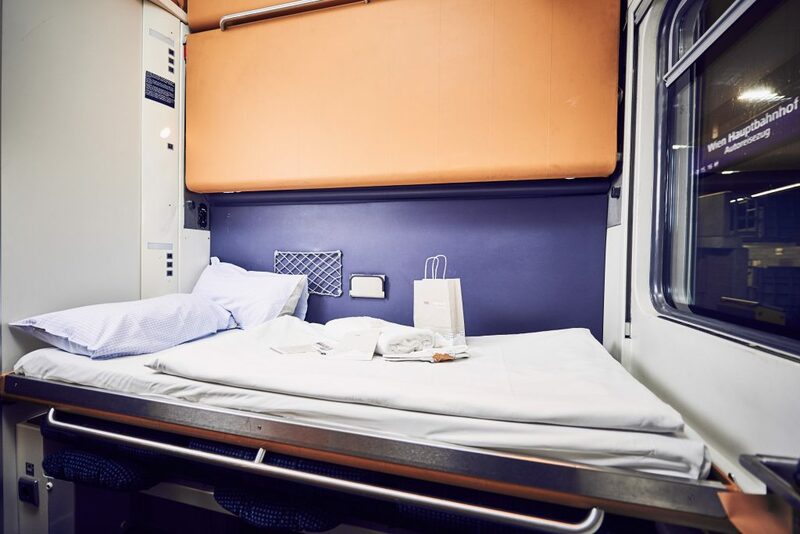 Eurostar’s own direct overnight ski train has no beds – so skiers have to sit up all night. Hardly the stuff dreams are made of. 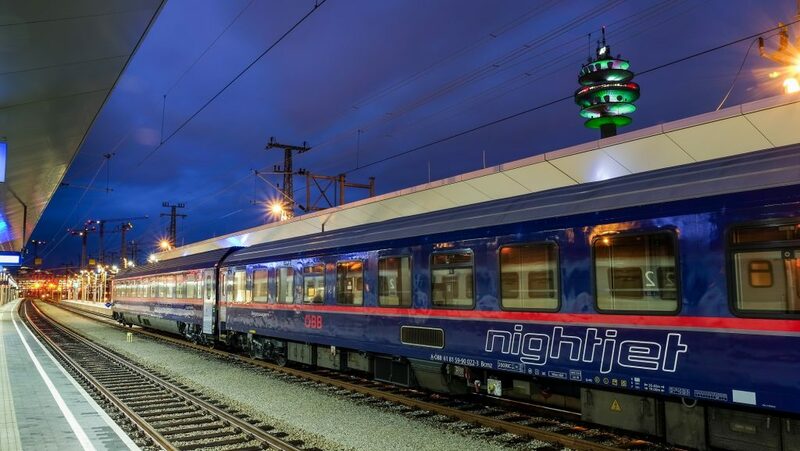 So when I heard that ÖBB, the Austrian national rail operator, had launched a network of “Nightjet” sleeper services through Germany to the Austrian Alps every night of the week, I felt a tingle of excitement. To catch the Nightjet, you need to get to Cologne. So at London St Pancras, fellow ski writer Rupert Mellor and I heaved our snowboard bags onto the Eurostar from London St Pancras to Brussels and from there caught an ICE train. The huge windows, masses of space, plenty of table seats and a proper restaurant on board make UK trains seem like a poor relation. 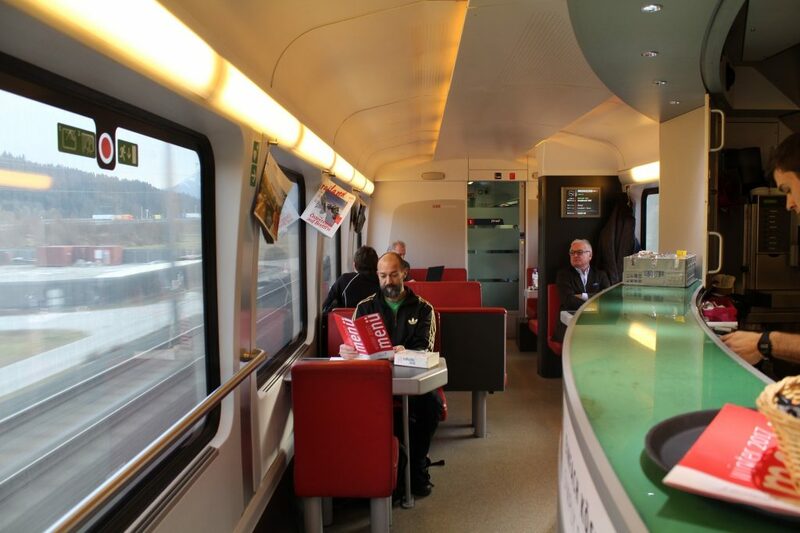 In the comfortable café bar we were served spaghetti bolognaise, freshly prepared salad, wine and draft beer – all while speeding smoothly at 300km per hour. At Cologne, we climbed onto the Nightjet and into our couchette compartment. There’s not a lot of room to spare, but the comfy bedding and cosy washbasin gave it a homely, hotel-like feel. We were soon being rocked gently to sleep by the train, dreaming of the slopes. We awoke to a knock from the guard delivering breakfast on a tray, before alighting at Wörgl, a few minutes from the village of Alpbach, a resort that has magnetised British clients for many years. It’s easy to see why. The village is home to some of the oldest, most attractive chalet buildings in the Alps. We grabbed a second, heartier breakfast and headed up to the top of the Schatzberg peak, to start weaving our boards around the network of red runs on the slopes high above Auffach, sampling spit-roast chicken at the Böglalm finished with a shot of Wildschönau Krautinger – turnip schnapps. We passed the impressive new Alpbachtaler Lauser Sauser roller coaster ride, constructed next to the Wiedersberghorn gondola. Soon it was time to slip out of Alpbach and head down the train tracks to Kufstein, closest station to the resort of Söll. 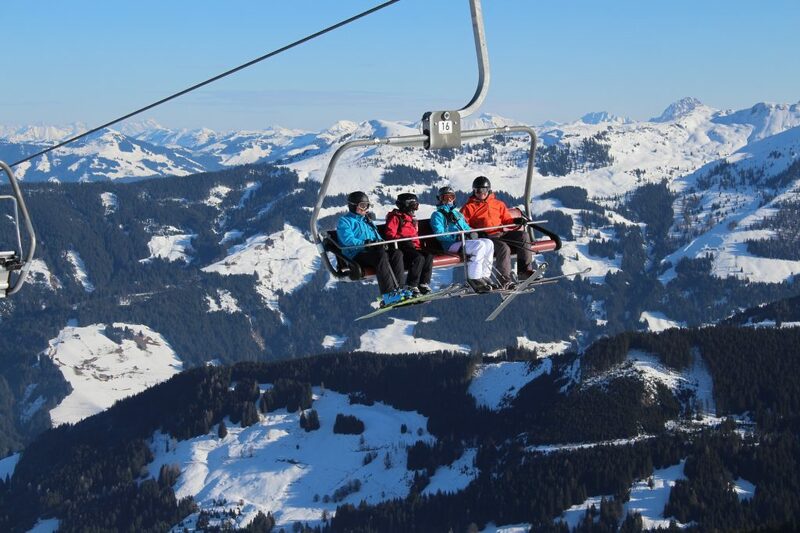 The resort is part of the huge SkiWelt – with 284km of slope, serviced by 90 ski lifts. Wandering through the friendly village at dusk, we entered a Tiroler Bauernstandl, a little shop and bar selling regional produce. “So you are English?” the gregarious owner asked. “Then sit down!” Wine was put in front of us and a classic BBC video from 1987, On The Piste, showing British skiers trying to lear n to ski, was played in our honour. 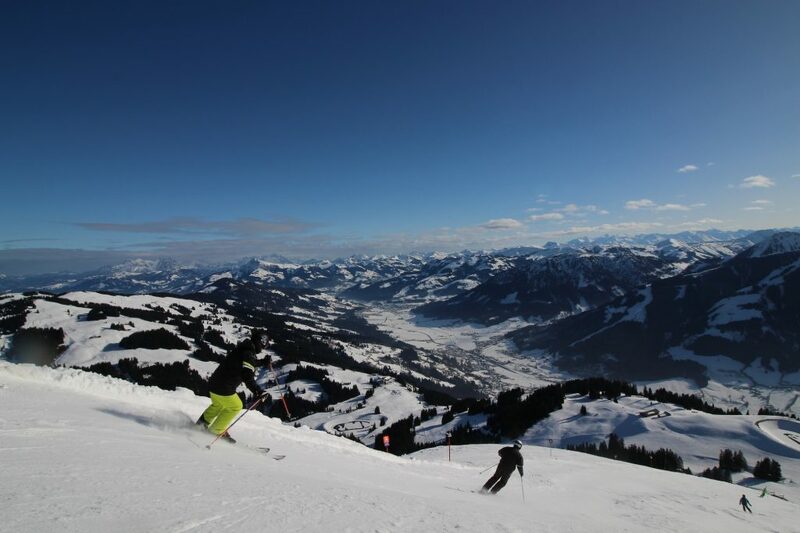 Unable to shake the hilarious images of flailing skiers from our minds, next morning we headed up to the Hohe Salve with its epic views over the Wilder Kaiser mountain range – best enjoyed from the sun deck of the rotating Gipfelalm restaurant which perches at the peak. Our guide, Anita from the SkiWelt tourist office, whizzed us around the slopes, stopping to visit the KinderKaiserland, a special area for very young children to gain confidence on skis, and to the Simonalm, a 400-year-old hut now guarded by friendly local “witches”. We left the SkiWelt feeling that we’d only scratched the surface – and indeed we barely had. However, our final destination, St Anton, was beckoning. On the way, we stopped for a day to visit Innsbruck and ascend the Nordkette cable car and then travelled to St Anton on a RailJet train through the spectacular Arlberg Valley to St Anton station, conveniently located in the village. That night, a huge new flurry of snow hit the region, continuing for two days. We followed our local guide, Folke, through the Gampen and Galzig areas and into tree-lined powder fields for which St Anton is renowned, and eventually back down for well-earned beers in the village – which seems to buzz at any time of day or night. Our reluctant return home took us back by RailJet train to Zurich, then by TGV onto Paris and by Eurostar back to London. With valleys, lakes, mountains and fields appearing and disappearing out of the windows, it didn’t feel like an 11-hour journey. More like another kind of magic carpet, but this time with us sat up, gazing at the scenery and daydreaming of our next return to the Alps by train. Daniel and Rupert travelled with Eurostar (eurostar.com), ICE and Nightjet trains (nightjet.com) with accommodation organised by Tirol Tourism (tyrol.com) and local tourist offices (alpbachtal.at; wilderkaiser.info; stantonamarlberg.com ). Depart London St Pancras on the 15:04 Eurostar to Brussels; take the 18:25 ICE from Brussels to Cologne; then take the 21:21 Nightjet sleeper train to Wörgl, arriving 08:36; from there it’s about 25 minutes by taxi. Return rail fares via Cologne from £195 return.